So writes Michael Noonan (edgetraderplus.com/) in edited excerpts from his original* article entitled Gold And Silver – Contrary To Popular Belief, Paper Is The Bellwether For Near-Term Precious Metals. How long will it take for a final bottom to occur in PMs? No one knows….When will fiat inflation come?…The bigger question…is: When will PM price “inflation” show up?…[The answer:]…gold never has inflation problems. Its counter-measure in fiat currencies always does. For us, the surest signs of problems will show up in those New World Order (NWO) paper markets, aka COMEX and LMBA. 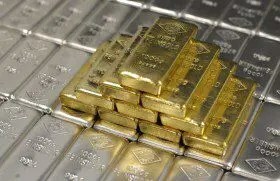 They are the bellwether to watch, for as long as price is captured in these so-called markets, the price of physical gold and silver remains captured within them, regardless of anyone’s opinion of the paper markets. Why is that? It should not be, but it is. Looking at the “faux” paper markets, they are like any other chart of any other market, they go up, down, and move sideways. Like any market, it takes time to turn a trend. From a down trend, a market usually goes sideways, allowing for smart money to cover shorts and establish longs. We will not pass on the merits of smart money already accumulating positions, albeit in the physical market, not in paper, and that could create an exception to a sideways move and lead to a V-Bottom, where price explodes to the upside. In either event, a look at the charts of the paper-tracked PM market [begs the question] … “Where’s the beef?” Where is the substance of anything? We see none in the charts [as shown below]. Weekly trend remains down. There was evidence of a potential upside breakout rally two weeks ago but no follow-through. It is possible last week was a supporting retest, but that will have to be confirmed by higher prices in the week coming, or gold will continue to languish in its paper malaise. The daily shows what is needed, more clearly than the weekly…If paper prices are to continue higher, there should be more evidence of absorption in the coming week. If not, this market remains weak. Silver is a totally different market. Unlike the labored retest in gold, note how labored the rally effort has been since the week-ending 21 July wide-range decline. It could be a reflection of the manipulation of the paper market, which makes a degree of sense, for the natural law of supply and demand has been missing during the JPMorgan take-down. Any argument for a silver recovery remains a fragile one until that market shows demand in the form of strong rally bars on increased volume…. 2. Noonan: Window of Opportunity to Buy Physical Gold & Silver Narrowing – Don’t Wait, Buy Now! 4. Noonan: Silver Charts Suggest This Could be the Bottom! 5. Noonan: Charts Suggest NO Ending Price Action In Either Gold or Silver – Take a Look! They been saying that for years about the dollar, its not likely going to happen in our lifetime, although it may happen but not anytime soon. I think gold and silver will continue to rise with some ups and downs along the way just like anything else in life. One thing I believe and that is that those that are supplying the numbers being used in Charts are gaming them in order to make the charts look better than they should! I’m guessing that $100 USD will become about $1 U$D (US New Dollar).